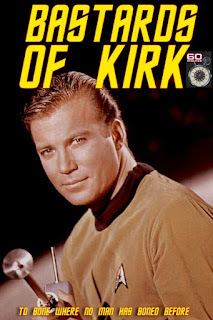 Synopsis: In the 23rd century, 60 minutes searches for the whereabouts of one James Tiberius Kirk. The Captain of the Enterprise has disappeared following a row of paternity lawsuits. As the news magazine investigates, they uncover illegitimate children and a conspiracy by the Federation that could have universal consequences and create all out war among the planets. And Kirk is at the center of it all. Bright Anvil Studios approached Writer/Director Maninder Chana in 2006, about doing CD cover design for a six-hour audio sci-fi series, Sectarian Wave (http://www.virtuallyaudio.com/radio-sectarian-wave.asp). Although they didn't end up using the design, that first meeting led to comic book illustrator and toy designer Logan Lubera asking for help in producing Bastards of Kirk. Chana and his producing partner at the time Bob Thompson wrote a script that slowly started growing in length given the scope of the Star Trek series. BOK was shot over a number days over the course of a month. The backdrops were built in the Bright Anvil Studio and also included location shooting in and around Toronto. The fan film debuted at the Toronto Comic Con in the fall of 2006. It has gone on to play at a number of big comic conventions and has become a cult favourite amongst comic and sci-fi geeks alike. Four years later, we are still receiving requests to show it at various festivals.